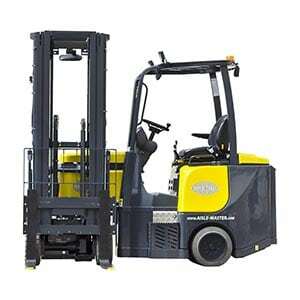 Narrow aisle forklifts offer much more maneuverability than standard forklifts. 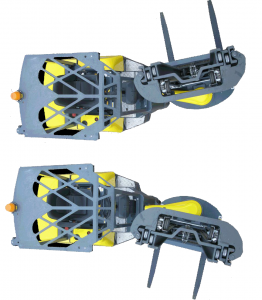 They handle loads well in tight spaces, as narrow as 72 “, and can even be small enough to maneuver restricted intersecting aisles as well as fit through a standard doorway. Narrow aisle forklifts are either Internal combustion or electric. The units are provided in both stand-up or sit down configurations. This allows for superior operator comfort, which will lead to greater productivity. 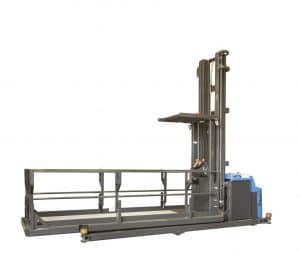 Our narrow aisle forklift options can be provided with a wide range of lift heights to facilitate the collection of individual items for any given order. Most often, they are used to pick and store inventory. But, each unit has a variety of benefits that improve efficiency and productivity in logistical environments. Cost effective — These smaller, more compact, narrow aisle forklifts offer better use of warehouse storage. Narrow aisle forklifts are perfect when you need more storage space. Increasing storage capacity by up to 50% you can get extra storage without expanding the existing warehouse footprint. They’ll pay for themselves in the long run as you notice a lower per pallet cost as compared to larger lift trucks. Safety — Using a standard sized forklift in confined environments leaves the operator open to risk of injury and damage to forklift or products . 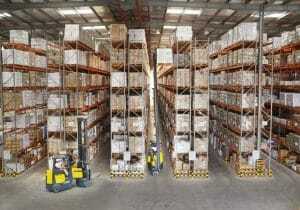 The extremely valuable maneuverability of narrow aisle forklifts decreases risks to both personnel and inventory. They’re constructed for outstanding operators visibility resulting in increased safety . Articulating forks — With articulating forks, the narrow aisle lift truck can drive straight down an aisle without having to turn the truck to pick an order. The articulating forks allow the operator to grab product from both sides of an operating aisle. No special guidance system is required to realize the narrowest aisles. The articulated design offers unbeatable maneuverability and superb visibility for drivers. Requiring as little as 72 inch aisles, these lift trucks can hoist up to 2,500 lbs as high as 50 feet. The Combi Order Picker platform truck can operate in aisles as narrow as 56.5″. Operators can move through aisles, building small customer orders without pulling entire storage bins. The order picker has very few moving parts, making it less likely to break down. Easy Street also offers pedestrian stackers that are ideal for very narrow aisle situations.